My dad, brother and I recently launched a crowdfunding campaign on Kickstarter. 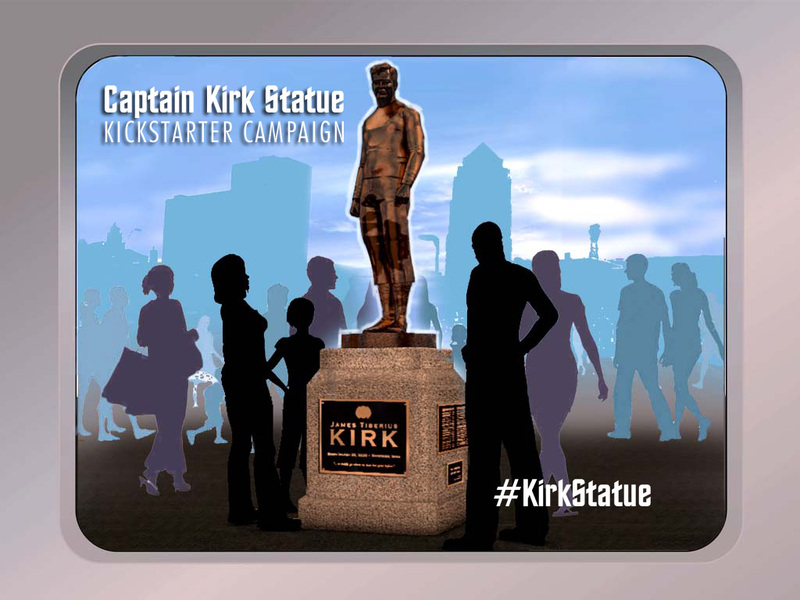 We’re trying to raise funds to build a life-sized statue of Star Trek’s Captain James T. Kirk here in Iowa. For those of you that might not know, the character of James Kirk was born in a small town in the State of Iowa. To some, the idea of three relatively unknown artists spearheading the creation of such a project is absurd. It’s not. Combined, we have over 50 years of skill and experience and pure determination to make this statue a reality. We have a plan and are in progress in implementing as much of it as we can before the campaign reaches its funding goal. So far, the response has been pretty good, but it has been a little slow going in getting the word out. The few naysayers have argued that no one wants to fund for a statue of a fictional character. This is not true. Recently a statue of Robocop (yes, Robocop) had been funded to be built and displayed in Detroit, MI. And then there’s the statue of Rocky Balboa in Philadelphia. I’m sure there are more examples I’m not thinking of. The point I’m making is that it isn’t a crazy idea. Star Trek and Captain Kirk have inspired generations “to boldly go” onto greater things for the world. So many scientists, engineers, astronauts, explorers and more have sighted Star Trek in inspiring and motivating them into their chosen fields. Not bad for a little television show. We want our statue to serve as a visual inspiration and awareness of the franchise for generations to come. Also, I’m not ashamed to say, that I want it to be another reason for people to come and visit the beautiful State of Iowa. I am proud to be an Iowan and to have a connection to such a great world that Gene Roddenberry had created. We would have had this statue built by now if we could. But financially speaking, the resources to produces such a thing and to the quality that it deserves are beyond our reach. Long story short, statues are not cheap. We aim to gain no profit from this. Our funding goal is to cover just the production and to fulfill the reward packages to our donors. Times are tough and not everyone can give. Believe me, I can fully appreciate that. But if you love Star Trek or know people who do, please tell them about this project. This is truly a project of the fans for the fans. But it won’t happen if the fans don’t know about it. So please, if you believe in this and want see this statue get made, share, share, share and use the hash tag #KirkStatue. I thank you all very much in advance! Guys! This project sounds awesome! We’ve got listeners around the world – thousands of downloads and over a hundred hours of content – not to mention a documentary film in post production and a potential TV series… We LOVE Trek! We’d also LOVE to get you on the show with Justin and Alexia to talk about this project and help get the word out. Shoot me an email and let’s get it set up!